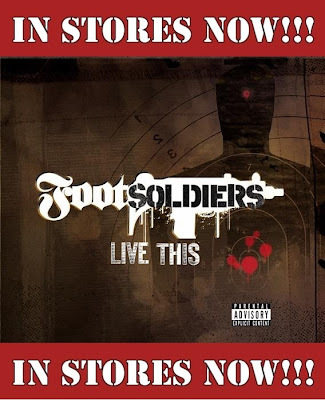 The concept of the Footsoldiers was birthed in the revelation that the next generation of Hip Hop is currently teaching your sons 9th grade social studies class or processing your home loan. It is very much a possibility that the next great legendary figure in our culture is sitting next to you waiting to pick up their son from daycare. They are working family men, they are hustlers, they are carpenters. They are among us, in the underground. Footsoldiers are TRIUNE, PROPAGANDA, ISHUES, RANDOM, and RAPHI a.k.a. BIG SHAME. Not mention allies, other soldiers from all over the country who were recruited to become a part of this movement. All from diverse ethnic and religious backgrounds with one thing in common... A purpose and burning desire to be the best. They are the personification of strength, passion and dedication.